The Ottawa Courthouse's green roof is a living landscape that supports 60 varieties of plants and protects the building's structure from the elements. 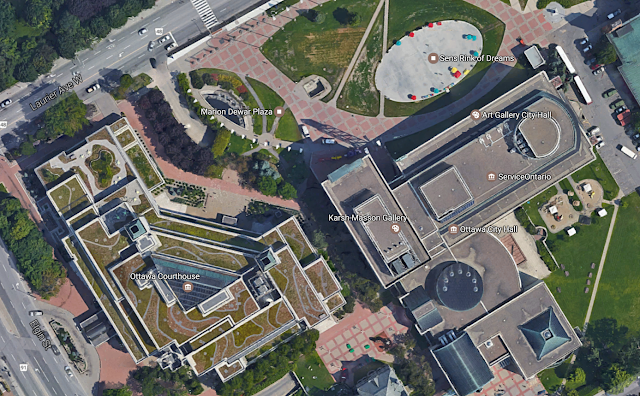 There are 26 separate green roofs spanning multiple elevations, for a total of 70,000 square feet of green space that will help keep Ottawa's air clean. While a conventional roof lasts only 20 to 25 years, green roofs last at least twice as long. The new green roof will save $23,000 a year in energy costs by reducing summer cooling and winter heat loss by 26 per cent." "Eight municipal buildings now equipped with solar panels." The Sustainable Neighbourhood Retrofit Action Plan (SNAP) is an innovative pilot program led by Toronto and Region Conservation (TRCA) in collaboration with many municipal and community partners. The SNAP program aims to accelerate the implementation of environmental improvements and urban renewal at the neighbourhood scale. It takes an integrated approach to overcome urban retrofit challenges and address a broad range of objectives with locally tailored solutions. Each SNAP neighbourhood features unique initiatives to inspire residents, businesses and governments to take action. The Beginner Fruit Tree Care Certificate Program consists of 9 two-hour classes. The students learned theory in the classroom but spent at least half of the 18-hour program out of doors, using their new skills in hands-on fruit tree pruning and care. We visited neighbourhood gardens to work on privately owned fruit trees of all ages. Often local homeowners, like Wilson Mosquera, had been encountering problems with their trees like fruit tree pest and disease problems and poor fruit production. Wilson and his family had apple, cherry and pear trees in their lovely garden. But his fruit trees trees were not thriving. The students came, sterilized their tools and got to work. They removed larger diseased branches with a handsaw. They improved the air circulation on the trees and promoted growth by removing smaller branches with hand pruners, loppers and pole pruners. Over two hours the fruit trees looked very different. Wilson and his family were impressed. “It was a surprise there was such help available for people (with fruit trees). The students talked to me and clarified all the things I didn’t know about how to care for my trees. It was a beautiful experience. Before I had a few issues with my trees, now (after the student’s work) they are doing well. Now one of my apple trees has produced so much fruit that the branches are starting to be heavy,” Wilson says. James Hackman uses a handsaw to remove a large diseased branch off a mature fruit tree in a local backyard. Students faced all sorts of challenges during the course, including challenges in their own newly planted orchard. But this year’s course came with many challenges. For instance, planting day was scheduled for May 15 and our goal was to plant 14 bare root fruit trees in the San Romanoway Orchard. But that morning there was an unseasonal wind and hailstorm! The students showed up ready to go to work anyway, but due to the terrible conditions we rescheduled the planting for the following day. The next challenge was drought. This year we had the driest spring that we’ve had here in Ontario for years. This, coupled with delays in setting up the orchard’s irrigation system, made it challenging for the group to irrigate the orchard’s young trees. But even that didn’t stop the San Romanoway Dream Team, who met in the orchard multiple times a week to water the trees using water from the site’s rain barrels or carrying heavy buckets of water from the nearby community vegetable plots. The students faced a fireblight breakout in their orchard as this nasty bacterial disease has been spreading in various locations in Toronto. And in another experience they found that an apricot tree planted years ago on the site was covered with a fruit tree pest called scale. That tree was removed to protect San Romanoways newly planted orchard. All this gave the students a glimpse of the challenges fruit tree growers can face and how important it is that you know how to protect your orchard with proper care. And yet, despite the challenges the San Romanoway Dream Team was amazing. They worked together. They came up with solutions. And the fact that the young trees on the site are growing well today is completely the result of their knowledge, teamwork and dedication. The Caledon SNAP is located in a mature neighbourhood in Bolton, Caledon’s major urban centre, within the Humber River watershed. Located in west Bolton, the neighbourhood is west of the historic core and is comprised mostly of residential properties, with pockets of commercial and institutional development. The neighbourhood is also comprised of parks, schools, green spaces and trails, and is transversed by Jaffrey’s Creek, a tributary of the Humber River. The local demographic is a mix of young to middle-aged families and older couples ranging in cultural diversity. This project is being led by the Town of Caledon, Toronto and Region Conservation Authority and the Region of Peel, working closely with neighbourhood residents and businesses. The SNAP will be an on-the-ground demonstration of the Town’s Community Climate Change Action Plan. We’re here to help you improve and renew your neighbourhood – to make it more sustainable, resilient and adapt better to future extreme weather. We provide you with tools and understanding so that you can make the best decisions for your home, property and family. Call us to arrange for a Program Advisor to visit your home and explain what may help protect your property from stormwater damage. These 20 minute visits will include a walk-around your property to review how your home and property can not only better manage stormwater, but also how you can potentially make use of this free resource! Pertinent information will be provided to you according to your needs. Join us to learn how to disconnect your downspout and more! Learn how to ‘Green your Grounds’ with such things as rain barrels and rain gardens. Representatives from the Region and Municipality will also be there to provide information on rebate programs and answer questions. Click here to reserve a seat.